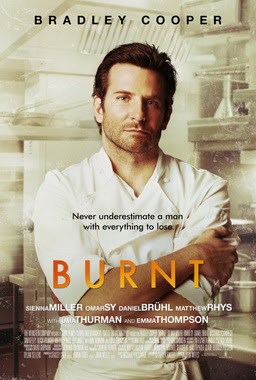 Bradley Cooper stars as Adam Jones, a hot shot chef who was on the verge of getting his Third Michelin Star in one of the best restaurants in Paris before drug use and his insane quest for perfection caused him to implode in spectacular fashion, taking down his restaurant and his career and the careers of quite a few of his friends along the way, He disappeared, sobered up and sentenced himself to exile in New Orleans shucking one million oysters. That done, he heads back to London to get back in the game, open a new restaurant and get the third Michelin star. Getting the band back together proves to be more difficult than Adam anticipates. The former maitre d of Jean Luc's restaurant (Daniel Bruhl) hasn't forgiven him and kicks him out of his family's hotel. A former sous chef from his old restaurant, Michel (Omar Sy) reveals that a drunk and drugged out Adam, jealous that Michel had opened his own restaurant, called the health inspector and released rats into his restaurant. An old friend, Conti seems to be more welcoming, but his talented sous-chef Helene (Sienna Miller) thinks he's conceited and old-fashioned. Max (Riccardo Scamarcio) is easier to get on board- but only once he's released from prison. A chef on the rise, David (Sam Keely) gives Adam a place to crash- but despite all that, his past haunts him as the drug dealers he owes money to show up, looking to collect. Eventually, after convincing a food critic to come to Tony's restaurant to review his cooking, Tony and his father agree to renovate their existing hotel restaurant to give Adam a new restaurant to launch. The launch, however, does not go well and Helene ends up quitting, only to be drawn back by Tony who offers her more money and some insight into Adam's behavior. Tony and his father, looking to protect their investment also require that Adam do drug tests weekly and go to a therapist (Emma Thompson) and gradually, Adam begins to open up a little bit. When they think that the Michelin inspectors are in town, Adam goes all out to prepare the perfect dish only to find out that that Michel has sabotaged him in revenge for what Adam did to his restaurant. Breaking down, Adam seems to be ready to jump off of Waterloo Bridge and shows up at the restaurant of his rival, Reece (Matthew Rhys) where he causes a commotion before attempting to suffocate himself with a plastic bag. Reece, despite the unfriendly relationship between the two, gets the bag off his head and comforts him, admitting the next morning that Adam is a better chef than he is, but that he needs Adam's cooking to keep pushing him to do better. Jean-Luc's daughter, Anne-Marie also shows up and ends up paying off Adam's debts to the drug dealers before giving him her father's knives. Adam begins to realize that he can't live his life alone- in the kitchen or outside of it and that he needs other people to help him in his quest for perfection. When the Michelin Inspectors finally do come to town (turns out the previous sighting was a false alarm) Adam and all the chefs work as a team to produce the best meal possible and finally, Adam gets his Third Star and some inner peace. Overall: It's not a bad movie and if you're bored and looking for something to watch on Netflix, you could make worse choices, but I've seen this story before and Chef does a better job telling it than this movie does. ** out of ****.